It was the Cossacks who discovered Siberia, protected Russia's borders, served under the Russian czars and rebelled against them. Europeans were terrified by the Cossacks, while Napoleon's marshals marveled at their skills in battle. RBTH takes a look at pre-revolutionary Cossacks who, without a doubt, were something very unique in Russia's history. It is impossible to say exactly when the Cossacks came into existence, although it is generally believed that Cossack history began some time during the 15thcentury, when the name starts to appear with regularity in historical documents. Escape from feudal oppression, famine, drought, disease, persecution from the Old Believers and other misfortunes forced the active and spirited people from all over Rus to set off in search of a better slice of the “no-man's land” – in the literal sense of the word – along the troubled shores on the East European steppe (in the lower reaches of the Dnieper, Don, Terek, Volga and Ural rivers). The word “kazak” (translated into English as “Cossack”) comes from the Turkic language family and means “someone that is free; an adventurer, a wanderer.” It is worth noting that the root of the word can be found in the name of the modern Kazakh peoples. It is on the banks of these great rivers that self-governed Cossack communities were formed – communities that were at constant war with the neighboring states and tribes. 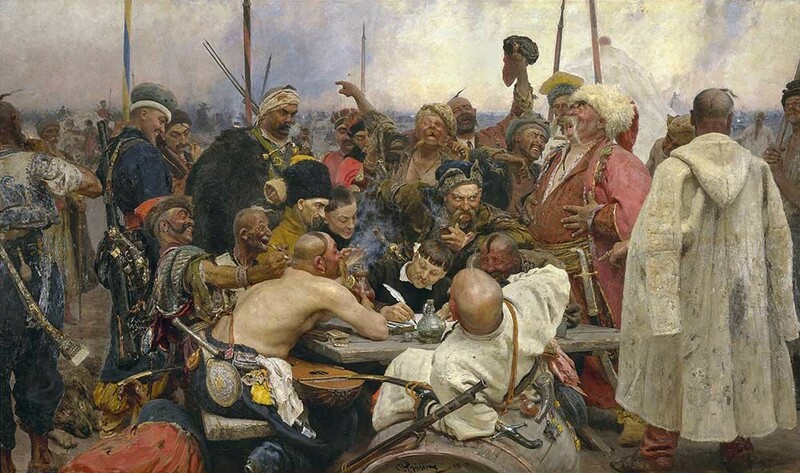 The Cossacks fought at, one point or another, with all of their neighbors (the Grand Duchy of Muscovy, the Crimean Khanate, Turkey and the Polish-Lithuanian Commonwealth); when the need arose, they forged temporary alliances with their erstwhile enemies. With many trade routes under their control, the Cossacks charged a toll to anyone who wished to pass through their territory. Sometimes they simply robbed them. Where exactly do the Cossacks come from? What is their bloodline? Researchers today tend to believe that, in addition to the obvious Russian and Eastern Slavic elements, there are also Turkish and Caucasian influences: Dark-haired and dark-eyed descendants of Cossacks can often be found. Cossacks speak – and always spoke – in dialects of Russian that, with the exception of the occasional word, are understood by any Russian. While Cossacks have never had a particularly strong national identity as such, they do have a well-developed class and confessional (Orthodox) identity. It was their Orthodox identity that eventually led the Cossacks to fall under the influence of a resurgent Muscovy – then the Czardom of Russia – initially under vassal (or feudal) law. The Cossack territories were governed by their own internal laws, which formed a kind of Cossack democracy. Cossacks would only choose commanders from their own area during times of war; when at peace, all Cossacks are considered equal. Understandably, such attempts were met with fierce resistance. Cossack Atamans staged numerous uprisings against Moscow, inciting the thousands-strong peasant masses to riot. Stepan Razin led a major uprising against Czar Alexis in 1670–1671. This was followed by Kondraty Bulavin's rebellion against Peter the Great and Yemelyan Pugachev's uprising against Empress Catherine the Great. Zaporizhian Sich was punished for the obstinacy of its inhabitants, as the empress had the territory dissolved and the Cossacks moved to the Kuban. Yet a number of Cossacks moved to the Ottoman territory instead and formed the Danubian Sich loyal to the Ottoman Sultan; others made it all the way to Vojvodina, where they served the Habsburgs on the border of Austria and Turkey. In spite of such strained relations, the Czardom readily used the Cossacks during times of peace between the two sides to help expand its territory. The role that the Cossacks played in the conquest and assimilation of the Urals, Siberia and the Russian Far East – and hence the Russian Federation – cannot be overstated. European travelers at the time called the Cossack “state” on the Dnieper River in the 16th–18th centuries (Zaporizhian Sich) a Christian Republic and noticed many similarities with the chivalric orders. A great many of the cities in these regions were founded by Cossacks, including the present-day capitals of Irkutsk, Khabarovsk, Omsk, Tomsk, the Sakha Republic, Blagoveshchensk, Petropavlovsk-Kamchatsky, Orenburg, Krasnoyarsk, Krasnodar and even Grozny – the list goes on. Cossacks reached the Pacific Ocean – but even the great water expanse could not contain them. In 1648, Semyon Dezhnyov discovered the other corner of America, expanding the territory of Russia into Alaska. The conquest of vast areas of Eurasia – areas that now form an integral part of the Russian Federation in terms of the economy (it is in these areas that the primary reserves of oil, gas, gold and other minerals are concentrated) – was partly the result of a strategic plan and direct orders from the czar's court, and partly the result of the Cossack's natural desire to live an independent and free life away from the czar and the government. We cannot ignore the fact that, because of their inherently hard nature – Cossacks are raised as soldiers from infancy – the Cossacks were harsh and often cruel in their dealings with locals. Still, it was the Cossacks themselves who laid the foundations for a peaceful co-existence between the Russian people and the natives whose land they were colonizing; unlike the Europeans during their expansion to other parts of the world, the Cossacks did not exterminate the indigenous people en masse. After Pugachev's rebellion died down, the imperial authorities decided it was in their best interests to avoid conflicts with the Cossacks. The mighty Cossack warrior class was finally born – it was now impossible to become a Cossack; you had to be born into it. The primary duties were to guard the empire's borders and serve in military campaigns. They received certain privileges from the czar for their service: large plots of land, tax-free status and the right to internal government. Tradition had it that every young Don Cossack received a horse, spear, sabre, rifle, dagger, two handguns and two sets of winter and summer uniforms from his family. 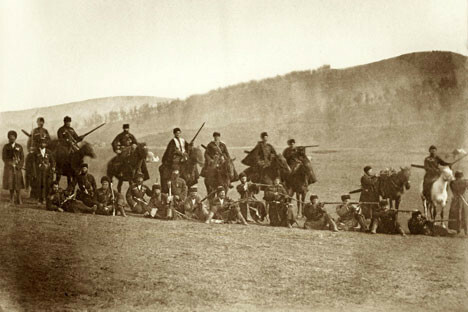 The Don Cossacks were even given their own autonomous territory – the Province of the Don Cossack Host. It was thanks to these concessions that the government, wary of coming into conflict with the Cossacks again, won their unconditional support. From this moment on, the Cossacks were one of the czar's most loyal peoples. They were extremely well-(self)organized, armed, skilled in battle – and always ready to spill blood “for the Czar and the Orthodox faith,” at that. 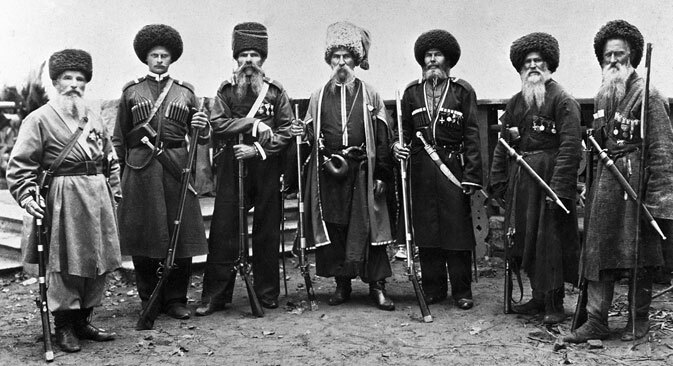 The 19th century was the Golden Age of the Cossacks. The Don Cossacks, under the leadership of Matvei Platov and alongside the victorious Russian army, routed Napoleon and took Paris. In doing so, they gave Europe and the world a new image of a fearless and invincible horseman, and the word “bistro”was adopted into the international vernacular. Not only did the Cossacks suppress rebellions on Russian soil (in Poland), they also saved the Habsburg Empire from insurgent Hungarians in 1848. Here, they found themselves fighting alongside Austrian subjects – the Serbs that had remained loyal to Vienna. In 1878, the Cossacks and the Russian army defeated the Ottoman Turks, finally bringing freedom to the Bulgarians, Serbs and Romanians. The Cossacks helped suppress local uprisings and fought bravely on the front lines during the Russo-Japanese War and World War I. All of this was before the terrible drama of the bloody civil war in Russia that began in 1918. Still, the history of the Cossacks in the 20th century is deserving of a separate story. • Czar Pavel I, who was in allegiance with Napoleon, sent Cossack troops to conquer India. However, his death put an end to the mission. • Napoleon Bonaparte and his marshals marveled at the Cossack's characteristic riding skills and admired the low saddle bow of Cossack riders. • Unlike European cavalrymen, Cossacks did not use spurs; they used whips instead. • Cossack horses are noted for their endurance and beauty. • You can always spot Don Cossacks in old paintings – they are the ones wearing blue uniforms with red trouser stripes and spikes. • Terek and Kuban Cossacks took on many traits from their neighbors in the Caucasus, including their style of dress, the way they dance, their weapons, etc. • The Shah of Persia had his own Cossack brigade that was modelled after the Russian Cossack Hosts. It was led by a Russian officer. • The village of Parizh (the Russian name for Paris) in Chelyabinsk Region in the Urals was named in honor of the Ural Cossacks who took part in the storming of Paris in 1814.